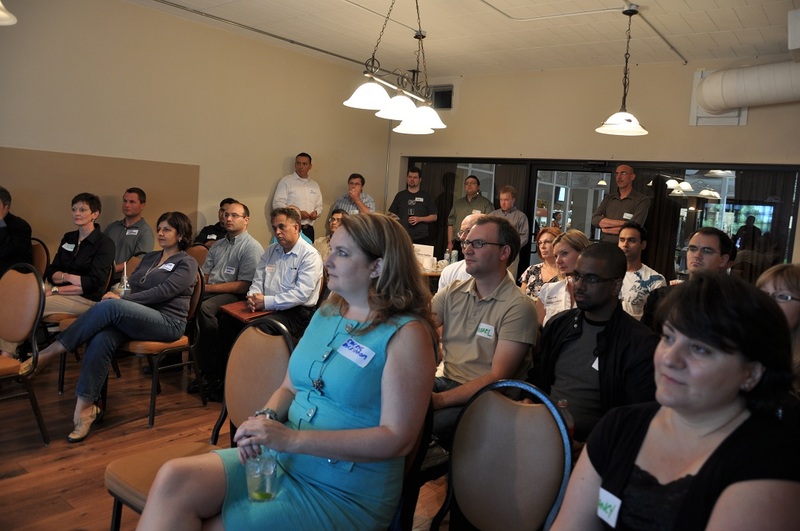 At the June 22nd meeting of Silicon Halton @SiliconHalton, we were privileged to have in attendance Cheryl McKinnon CMO (Chief Marketing Officer) at Nuxeo and the former Director of Enterprise 2.0 at OpenText. Cheryl provided the meeting’s keynote presentation wherein she illustrated how professionals can use social media to promote both themselves and the companies for which they work. The key point of her presentation was that social media helps to break down the barriers of geography, culture and generations to connect you with the individuals and communities that are important to both you and your company. In her presentation she gave a real world example of how her use of social media and the online presence she had created through her role at OpenText landed her current job as CMO of Nuxeo. Cheryl had not set out to find a job, but her blogging and use of Twitter was noticed by the 28 year old founder and CEO of Nuxeo, a 100 person company based in Paris, France. He was impressed with the interactive community she had built for OpenText and in particular, the dialogue that was being generated between Cheryl and OpenText’s customers. He decided he needed her to do the same for his company. The fact that Cheryl was born in a different generation, speaks a different language and lives on a different continent were not important factors in his decision to hire her. What was important was the connections she had built with potential Nuxeo customers. In her presentation, Cheryl expanded on how social media is becoming ever increasingly important to professionals who are interested in managing their careers and expanded on that by speaking of how Nuxeo uses only Social Media and specifically Twitter as the sole channel for all of its hiring. In the SlideShare and video clips below, Cheryl shares some practical things that you can easily do to expand and enhance your connections into the communities that are of interest to you. The Nuxeo platform is an Open Source ECM (Enterprise Content Management) system that counts among its long list of customers the BBC, European Commission and several ministries of the French government. View more presentations from Cheryl McKinnon. I apologize for the rough start and some of the hand-held camera shake. I hadn’t actually planned to shoot video of Cheryl’s presentation, and she was about 15 seconds into her presentation before I got the bright idea that I should capture it on video rather than hand write pages of notes. Towards the end of the presentation my battery was drained and the Nikon would only shoot 30 seconds at a time. Thanks to Ken Lowe who shot the last two segments with his camera. I’ve been designing and building software and leading software teams for over 20 years. I am the founder of projectyap.com (agile project management that’s social) yapagame.com (social media and micro blogging for sports fans). I missed this Silicon Halton meeting and missed a great presentation as well. Great examples of the business value a good social media strategy and campaign can bring to an organization, of any size. Thanks for posting the video and slide deck. Thanks Jason. I’m glad you found it useful. Hopefully you can make it out to the next meeting.